"A popular South American way to serve plantain. Simple and delicious. Optional: Serve with aji criollo." Place plantains on the prepared baking sheet; brush plantains with butter. Bake in the preheated oven for 30 minutes. Turn plantains and bake on other side until golden brown, about 15 more minutes. 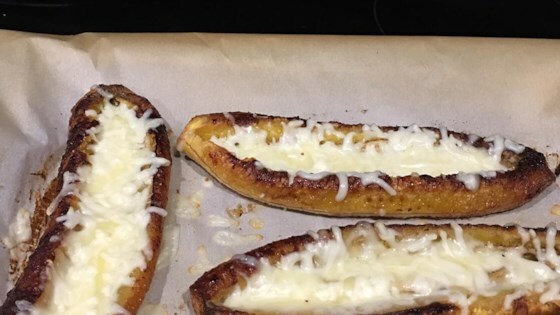 Remove plantains from oven and make a horizontal slit down the middle of each; stuff with mozzarella cheese slices. Bake until cheese melts, 2 to 3 minutes. Excellent. I used very ripe plantains, a cheap mozzarella, shaved, and Mrs. Renfro's (mild) salsa. Made for a great hors d'oeuvre. Thanks for the great recipe. My first time trying this fruit! I liked the recipe, just missing some salt. Maybe I didn’t put enough cheese? I tried with garlic salt and it did taste better. A keeper for sure!